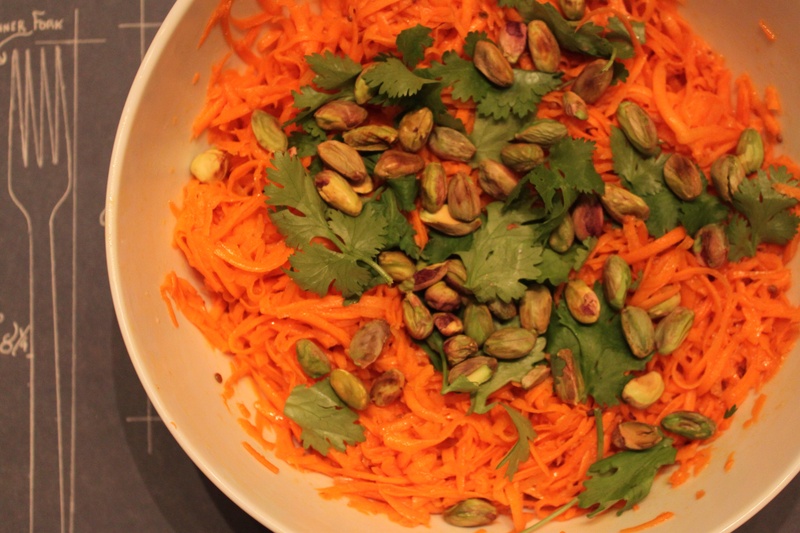 If you’re looking for a different spin on a side or salad, this coriander carrot salad might just be the trick. A healthy crunch of carrot and pistachio, a nice bite of acid and spice from lemon juice and coriander, you’ll need to season to taste – I thought it needed more salt and lemon juice. This would be delicious on a leftover sandwich the next day – BBQ, Bahn Mi, you know. Preheat oven to 350°. Toast pistachios on a rimmed baking sheet, tossing occasionally, until golden brown, 6–8 minutes. Let cool; coarsely chop. Toast coriander in a small dry skillet over medium heat, tossing often, until fragrant, about 1 minute. Let cool; coarsely chop. Whisk garlic, lemon juice, red pepper flakes, and coriander in a large bowl, then whisk in oil; season with salt. Add carrots, toss, and let sit at least 30 minutes. Toss with cilantro and pistachios just before serving.